Move oven rack to lowest position. Heat oven to 325°F. Remove and discard neck and giblets from turkey. Rinse turkey inside and out with cold water; pat dry with paper towels. Fasten neck skin to back of turkey with skewer. Fold wings across back of turkey so tips are touching. In shallow roasting pan, place turkey, breast side up. In medium microwavable bowl, stir together butter, mustard, rosemary, salt, pepper and beer. Microwave uncovered on High 1 to 1 1/2 minutes, stirring after 30 seconds, until well mixed. Brush about 1/3 of mixture evenly over surface of turkey. Fasten drumsticks together with cotton string. Insert ovenproof meat thermometer so tip is in thickest part of inside thigh and does not touch bone. 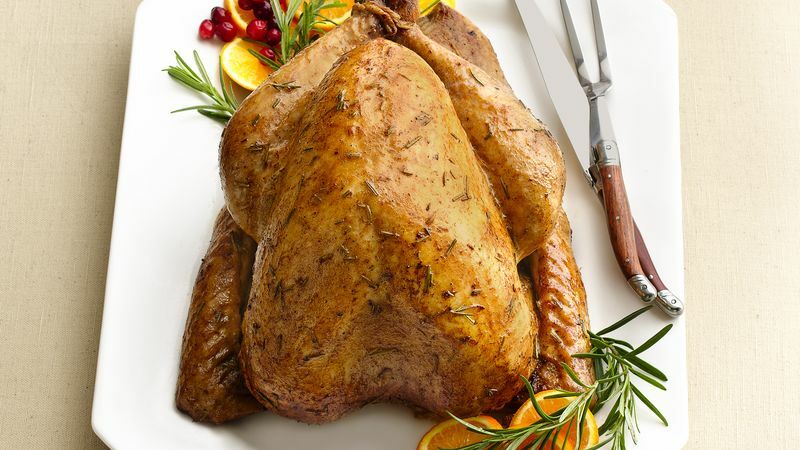 Let turkey stand 15 to 20 minutes for easier carving. Remove skewers before slicing. Meanwhile, measure drippings and enough water to make 2 cups. In 2-quart saucepan, heat drippings to boiling. In small cup, stir together cold water and flour until smooth. Stir flour mixture into boiling drippings. Continue stirring 2 to 3 minutes longer or until gravy is thickened and bubbly. Add 6 to 8 small peeled onions to roasting pan after 1 hour of roasting. Garnish platter with roasted onions, fresh rosemary sprigs and orange slices. Add a touch of Bavaria to the Thanksgiving table by serving this turkey and gravy with spaetzle. Use any leftover turkey to make Turkey-Sweet Potato Pot Pies. Find the recipe on pillsbury.com.